100 DVD cases that store upto 4 DVDs or CDs. 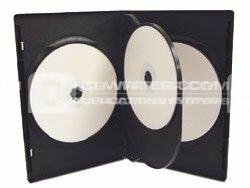 These cases have a flip inside that holds 4 discs. Picture for illustration only. QUAD . DVD . cases . packed . in . 100 . s . Unbranded .